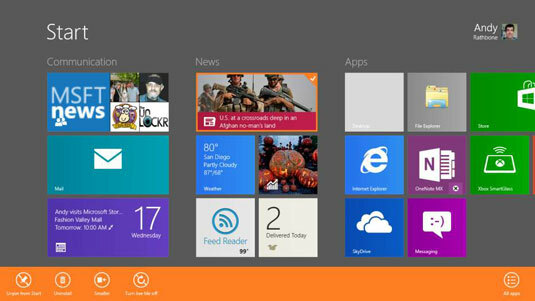 Before you can uninstall or change an app on your Windows 8 tablet, you need to select its tile on the Start screen. Oddly enough, selecting an app’s tile isn’t something you’ll stumble upon on your own. So, here’s the secret to selecting an app on the Start screen: Slide the app slightly upward or downward with your finger. After you select an app, a check mark appears in the app’s top-right corner, like the News app shown. The App menu also appears along the bottom, listing everything you can do with your newly selected app. To uninstall an app, tap the Uninstall button from the App bar. App bar icons also let you change the size of an app’s tile, start or stop the app’s live updates, or unpin (remove) the app from the Start screen. In Windows 8, you select an item by sliding it in the opposite direction it normally moves. Because the Start screen scrolls from right to left, for example, you slide a tile up or down to select it. Use this trick whenever you want to select something in Windows 8 or within any of its apps. Selecting the Start screen tile of a traditional Windows desktop program brings a slightly different set of icons to the App bar. You can open the program in a new desktop window, pin it to the desktop’s taskbar, or view its location in the desktop’s File Explorer program. You can select more than one app at a time, which is handy when weeding out unwanted tiles to remove from the Start screen.